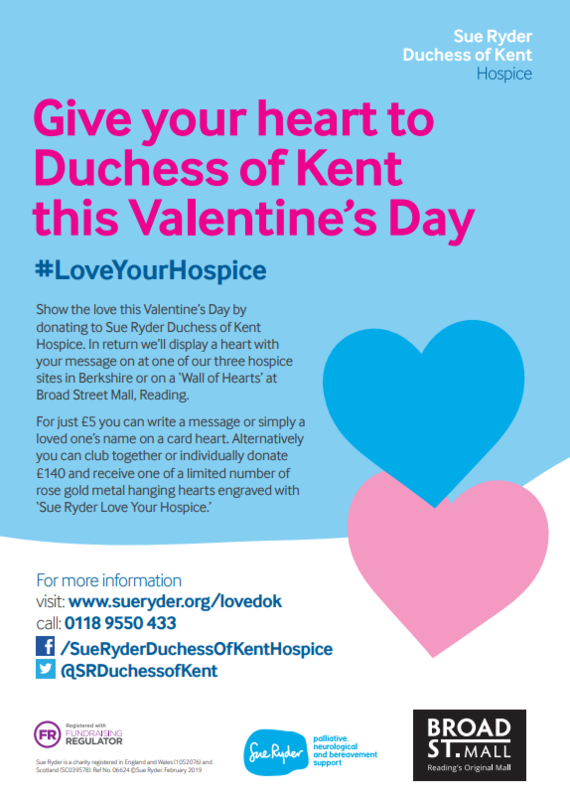 This Valentine’s Sue Ryder Duchess of Kent Hospice is on a quest to share the love with current and future hospice patients by recruiting local businesses to sponsor a rose gold heart, engraved with the message ‘Sue Ryder – Love Your Hospice’. The metal hearts can be purchased for £140 – the cost to fund a hospice nurse for just one day and will be displayed at the organisation's own premises. For just £5 you can purchase your own card heart, on which you can write your own heartfelt message of support for the hospice and its patients and then hang it on the Wall of Hearts. All proceeds will go directly to Sue Ryder and support the services they offer our community. You can pick up your heart at the Wall of Hearts in Central Square, from Saturday 9th February, where you can also meet the Sue Ryder team and learn all about the work that the hospice does.